In the post prior to this one, I promised a part 2 that would be posted “soon”. Clearly I have a heavily flawed definition of “soon”. In fact, my definition of “soon” is so flawed that I have waited for months to even begin writing this post. It’s a little shameful to admit. Not to mention, this post was supposed to track our chicken’s development from where I left off in the last post until the present. 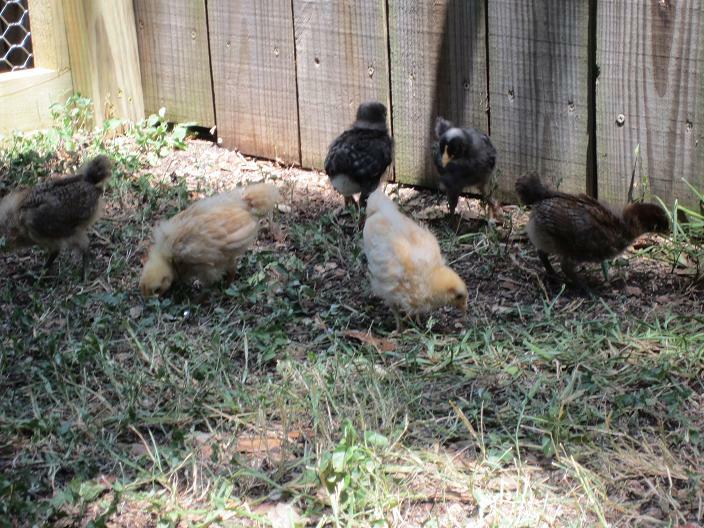 But as present became ever-farther from the date of my last post, and young chickens continued to grow, I hadn’t a single picture on my camera that accurately depicted how the chickens really look in the present. This lead to me having to take more pictures, which meant more photo editing and uploading, which means posting would take too long, which means I continued to procrastinate. Yup, just a little bit shameful to admit. Anyway, long-awaited as this post has been, I figure I should stop apologizing and start updating! So, where was I after last post? And here’s a picture of them now! Clearly, they haven’t been wasting any time growing into their adult feathers, or growing up in general. Also, we’ve officially confirmed that all of them are hens! 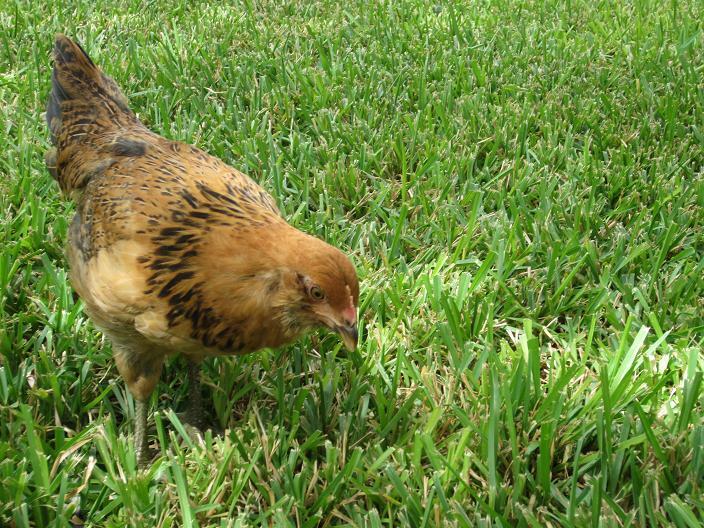 This is great news for us, because roosters are not ideal neighborhood pets… for obvious reasons. 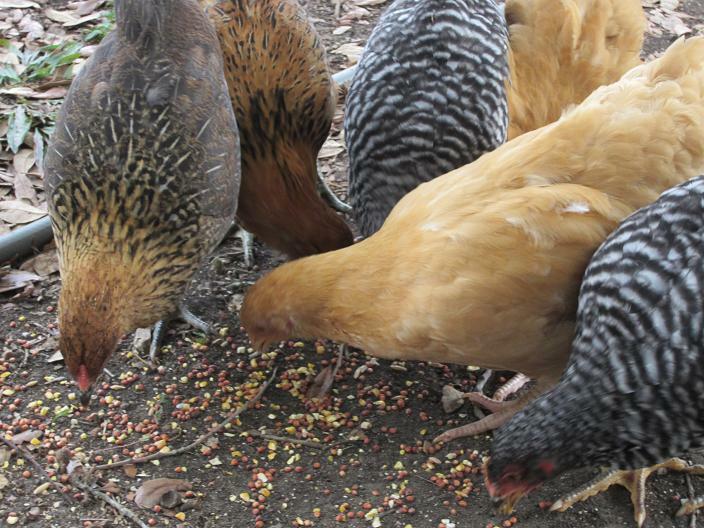 A hen can and will lay eggs without having a rooster around, so we were delighted to learn that all the six chickens we bought would grow up into egg-laying, non-crowing hens. They’re not quite there yet, though. In the mean time, it’s lots of fun to watch them grow. Wanna see some more pictures? 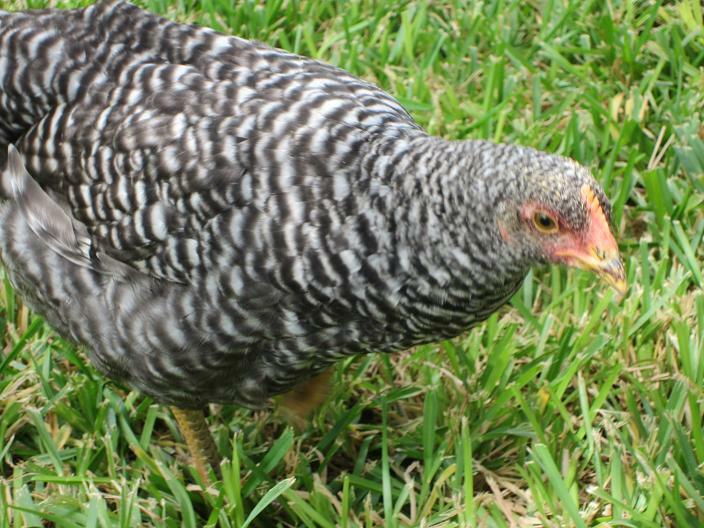 This is Autumn, an Easter Egger chicken named by Gloria. Nellie, our other Easter Egger, was named by John. Don’t you love her bright orange feathers? 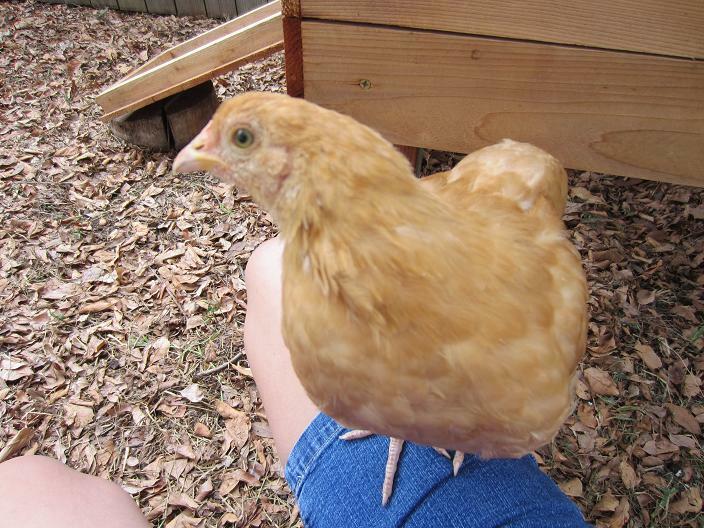 This is Mumthers, a Buff Orpington pullet. Daniel named her after a character in a book who could cook anything, and make it beyond delicious. He reasoned that with a namesake like that, his hen would lay the most delicious eggs of any of them! So far, she seems to be pretty food-savvy; she sticks around us even when the other chickens are off playing, hoping to get treats! 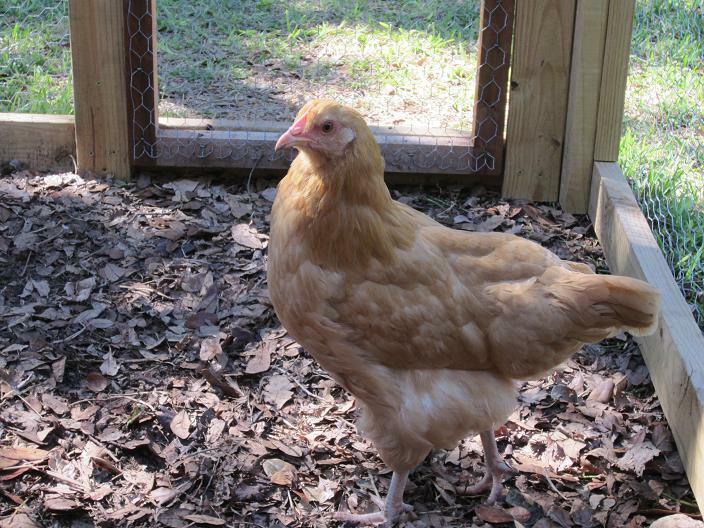 Sunshine, also a Buff Orpington pullet, was named by Daddy and looks a great deal like Mumthers. Her feathers are a slightly lighter hue, pretty much the only indicator we can use to tell them apart. 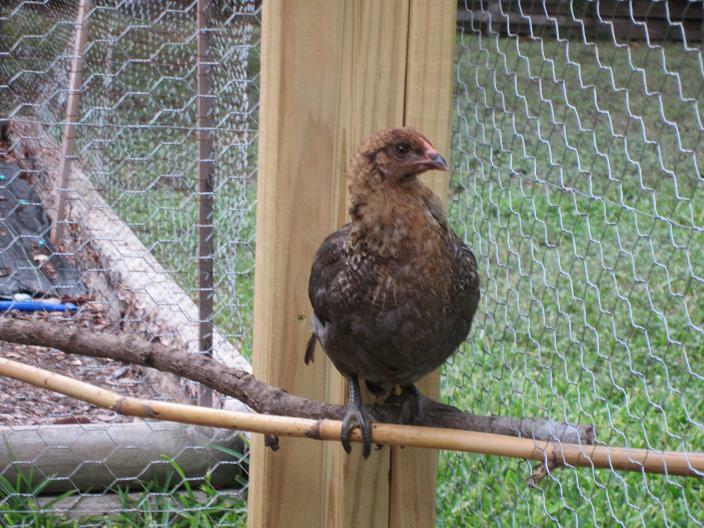 And finally, this is my hen, Bobbles. 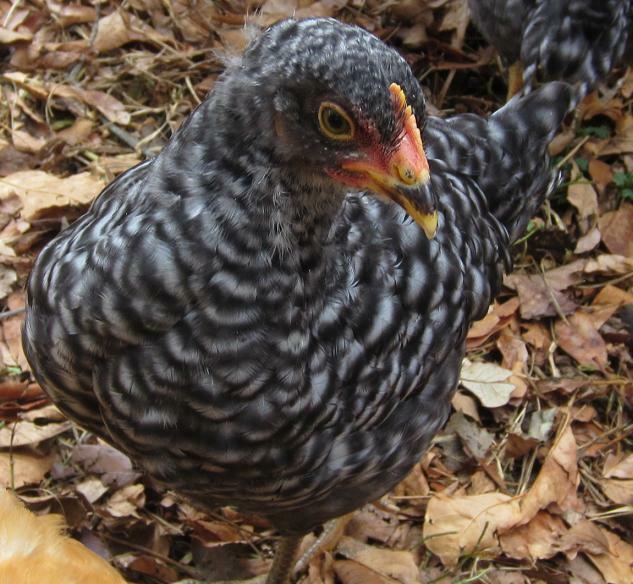 She, like Merry Poppins, is a Barred Rock pullet. She’s also a big eater and the fattest hen of the bunch! Having chickens has been a blast so far. And now, having fulfilled my blog-posting duties, I’m heading outside to go feed them! Edit: I wrote this post a long time ago and only just now bothered to post it, so the chickens are actually even bigger than you can see from here. This entry was posted in Everyday Life, Family and tagged chickens, delayed-posting, fun, kids, outdoors, pets. Bookmark the permalink. Proudly powered by WordPress | Theme: 茄子 by Peter D. Cassetta.